Prime Minister Najib Tun Razak’s visit to China this week marked a major turning point not just in Malaysia-China relations but in China’s rise to regional supremacy. During the visit 14 major agreements covering infrastructure, commerce, education and manufacturing worth RM143 billion were signed. Malaysia also signed an agreement to purchase 4 “Littoral Defence Ships” from China, a first for Malaysia. As well, Najib also alluded to some sort of new agreement under which China would protect and defend Malaysia’s sovereignty. Coming so soon after President Rodrigo Duterte’s “separation from the US,” Malaysia’s realignment with China could well sound the death knell of President Obama’s ‘Pivot to Asia.’ Though Washington is playing it down, it is quite clearly a major setback for America. The US and other Western nations must now be wondering how Najib went from being feted in Western capitals as a staunch American ally, a model Muslim democrat and “reformer” (to use President Obama’s words) to breaking ranks with them and moving his nation into China’s orbit. Malaysians too must wonder how we went from a carefully crafted equidistant approach in foreign policy to almost overnight alignment with China. Good relations but on what terms? Good relations with China is, of course, a no-brainer. China is, after all, Asia’s pre-eminent political and economic power. Few doubt that it will, in the not too distant future, overtake the US as a global superpower. It is also Malaysia’s largest trading partner and its second biggest foreign investor. Without doubt, China has become indispensable to Malaysia’s development and prosperity. The real issue, however, has always been about the kind of political relationship with China that would best serve Malaysia’s overall interests, one that would facilitate economic cooperation without compromising the nation’s independence and sovereignty. For decades, there was a deeply held conviction that an equidistant approach between Washington and Beijing would be politically and strategically the most advantageous. This conviction, which was also shared by many other Southeast Asian leaders, found expression in such policies as the Zone of Peace, Freedom and Neutrality, the Southeast Asia Nuclear Free Zone and in ASEAN itself. And it seemed to have served its purposes well with Malaysia and other ASEAN countries quietly successfully being able to balance the competing interests of both Washington and Beijing to its advantage. Prime Minister Najib now appears to have abandoned this long-standing approach to big power relations. In the zero-sum game of big power rivalry, the consequences for Malaysia, and the region, will be enormous. A policy shift driven by 1MDB? Interestingly, unlike previous major policy changes involving China, there were little or no signs of a comprehensive internal debate prior to this latest move. Tun Razak’s historic visit to China in 1974, for example, which saw the establishment of diplomatic relations, was preceded by months of internal discussion and debate. Likewise, Dr Mahathir’s landmark visit to China in 1985 and the opening up of full political, commercial and people-to-people relations with China came after much deliberation and high level internal discussions. From what can be ascertained, the impetus for change came from the prime minister himself and appears to have been driven more by the need to mitigate the 1MDB scandal rather than any calculated assessment of national interests. The 1MDB scandal, which has dominated Malaysian politics for the past year, has left Najib politically vulnerable and exposed. Internationally, the decision by the US Department of Justice to formally investigate 1MDB related corruption and money-laundering offenses as well as similar investigations in other jurisdictions have both isolated and embarrassed Najib. The depth of Najib’s anger at the US and the West in general was evident in his national day message a few months ago. It boiled over again in Beijing when he sallied forth against “larger countries” and former colonial powers. Speaking to the China Daily, he complained about foreign meddling, of being treated unfairly, of being lectured to. In not so many words, he also contemptuously dismissed the US and other Western powers as has-beens with no future in Asia – strong language from a man who until recently was seen as one of America’s closest allies in the region. And his oft-repeated references to China as a “true friend” were clearly aimed at his erstwhile golfing buddy and one-time enthusiastic supporter, President Obama, whose rebalancing towards Asia he enthusiastically welcomed only a few years ago. In need of an urgent bailout and angry at what he saw as US interference and lack of appreciation for years of pro-US policies, Najib opted to play the China card. He is now counting on China to erase 1MDB debts, pour in new investments and loans to keep the economy growing, entice Malaysia’s recalcitrant Chinese voters back into his coalition and finesse the festering territorial dispute with China in the South China Sea. If China can deliver on these hopes and if Najib can convince his own party, a party that has long been accused of anti-Chinese bigotry, to support his new alliance with China, Najib might well earn for himself an indefinite lease on political power. Undoubtedly, it is a bold and daring move but not without a downside for Malaysia. Perhaps the biggest concern is how Malaysia will manage the asymmetrical relationship with China. Given the massive Chinese investments that are now pouring into the country and Malaysia’s rising indebtedness to China, how will Malaysia ensure that it is not overwhelmed by China? It is common knowledge, after all, that China doesn’t just invest for purely commercial reasons. Its state corporations often function like quasi-government departments which act in furtherance of Beijing’s national agenda. With each new investment, therefore, China’s control over the economy, and its corresponding political leverage, increases. Ownership, after all, has its privileges. Will our divided, corrupt and dysfunctional political system be up to the challenge of managing the giant we are now gleefully inviting into our midst? If the hugely expensive East Coast Railway project, now being touted as a major achievement, is anything to go by, we may soon find ourselves awash in Chinese projects which will be great for China but less so for the taxpayers of Malaysia who will end up paying for it. On the maritime file, the hope that close relations will somehow contribute to a happy resolution of Malaysia’s dispute with China appears to be based on the misguided assumption that China is genuinely interested in resolving its territorial claims on the basis of international law as it once openly promised to do. Its angry dismissal of the recent Hague ruling which found that China’s claims within the nine-dash line were without legal foundation put an end to that charade. 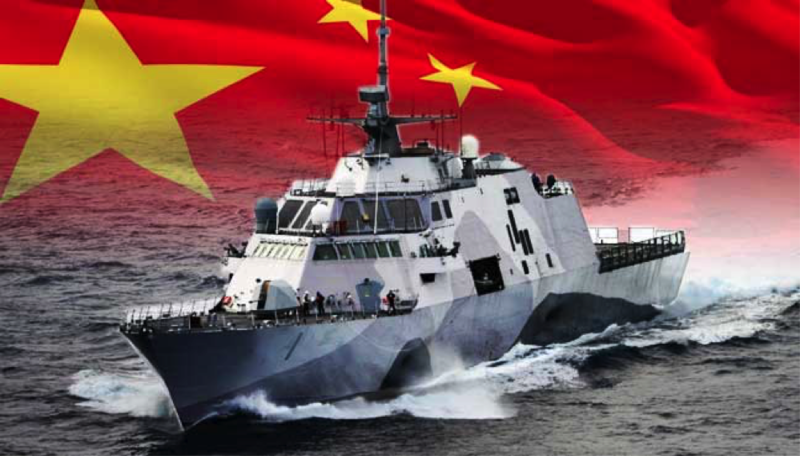 China has declared the South China Sea a “core interest,” meaning that it is fundamental to the security and well-being of the Chinese state and must be defended at all cost. It’s not just about geopolitics; it’s about access to vast mineral and food resources that China needs to sustain itself over the longer term. In pursuit of this “core interest,” China has not only devoted much resources to building up a strong military presence in the South China Sea replete with air defence systems and permanent air and naval stations, it has moved to assert de facto control of all disputed islands, reefs and shoals. Over the past few years, Chinese naval and coast guard vessels have regularly and persistently intruded into Malaysian waters to enforce their ownership. In March this year, Shahidan Kassim, Minister in the Prime Minister’s Department, reported that more than a hundred Chinese vessels had intruded into the waters around Beting Patinggi Ali (Luconia Shoals). Defence ministry officials quickly denied it. At one point, the Chief Minister of Sarawak was so alarmed by these developments that he protested the lack of action especially since Sarawakian fishermen were being evicted from their traditional fishing grounds. Clearly, Malaysian officials, fearful of upsetting China, appear to have progressively scaled back their responses. Where once there was talk of a “pushback,” there is now only proforma diplomatic exchanges. Will greater dependence on China and the prospect of yet more lucrative contracts further weaken Malaysia’s resolve to stand up to China in defence of its territorial integrity? In any case, the most likely arrangement that Najib can expect from China is the one that is now being foisted upon China’s other new close friend, President Duterte of the Philippines – in return for not challenging China’s sovereignty over disputed waters, China would permit local fishermen access to the area. Hardly a win-win solution. The realignment with China could also have implications for Malaysia’s democracy. In recent years, Najib has gradually moved to reduce Malaysia’s democratic space by curbing popular protests and silencing dissent. Dozens of opposition politicians, civil society leaders and activists have been harassed and jailed. Legislation has also been introduced that would give the executive almost untrammelled powers should it be needed. Western democracies, with the strong encouragement of local pro-democracy groups, have quite rightly sought to pressure Najib to reverse this tragic slide to autocracy. With China’s support, Najib will now be able to rebuff such pressure and demand that the West accept him on his own terms if they want to do business with Malaysia. Najib’s insistence while in China that the West accept “standards and requirements… Asian in origin” rather than “the lopsided ethos” of the West is nothing but an outright demand for the West to acquiesce in his increasingly authoritarian form of government. Will political expediency and wider geopolitical considerations prevail to the detriment of Malaysia’s democracy? Despite the fawning news reports of great breakthroughs and big achievements, the new deal with China has all the makings of an unequal relationship. It gives away too much. It narrows our manoeuvrability and limits our options. It makes us too dependent on a single nation whose intentions we have yet to fully comprehend. It pulls us further away from our democratic moorings. It needlessly antagonizes friends who have stood with us in tough times and trading partners which are still vitally important to us. It unravels decades of hard work in building a nation that is open to all but subject to none. It is political expediency at its worst. We will count the cost of this folly in due course.